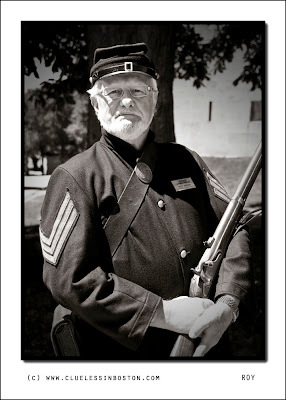 Meet Roy, he volunteers as a Civil War interpreter at Fort Independence on Castle Island in Boston. He says he came to his love of theater because of his English teacher, Miss Rose. And that led him to doing what he does now, combining his interest in theater with his interest in history and the American Civil War. If you like this monochrome picture, click here to find other Monochrome Maniacs so you can enjoy their photos as well. Very good portrait, he looks perfect. He certainly looks the part. Great portrait - one foe his wall. An excellent shot, he looks like he has posed before. I'm a bit of a Civil War buff although I'm a Brit. I have a link on my blog to my CW site on the 1863 Battle of Chickamauga. Perfect portrait of a man who knew how to mix all his interests !The B&W makes him beautyful! Reminds me of the Sealed Knot - The UK re enactment of the our Civil War. This guy really looks the part. he has a perfect face for doing what he does. And he looks good at it. And you have shown him off well. Great portrait! The shadow across his face is perfect. Bless his English teacher. Bless teachers in general. This is a shot that invites the viewer in. Splendid, Clueless. Roy looks totally authentic in his role. I bet he'd be a terrific guide. Great shot. He looks so stoical. Superb portrait. He looks very dignified. I'm glad there are people like him! Sounds like he found the perfect job! That is a nice portrait. This is a fantastic image of Roy, the Civil War interpreter, who also impersonates Edgar Allen Poe, thanks to Miss Rose. He looks very authentic, with the exception of his watch, name tag, and glasses. You've added to the authentication with your choice of black and white. Excellent work! Incredible picture, is travel in the time!!! An excellent portrait, Clueless...the expression on his face is superb! He looks very serious about his business. Great expression - nice portrait! Lovely and sharp image, it is nice to see dedicated people.